Editors Jaym Gates and Andrew Liptak have put together a solid collection in War Stories. It has a solid line-up of authors, including some contemporary authors with stellar bibliographies of short work, like Ken Liu, Thoraiya Dyer, and Yoon Ha Lee. Aside from Greg Drobny, a former self-titled “Army guy,” it also features stories from authors who’ve served in the armed forces: Janine K. Spendlove, Marc Jacobsen, and of course, Joe Haldeman. The anthology is divided into four parts: Wartime Systems, Combat, Armored Force, and Aftermath. Drobny reminds us that war is about the people who fight it as much as about the big ideas behind it. Again: much like fiction. The standout stories in this anthology have the struggles of their protagonists firmly at the forefront, beginning with Joe Haldeman’s “Graves”, a reprint that won the 1994 Nebula for Best Short Story. The narrator, an American soldier fighting in the Vietnam War, has been assigned to work at Graves Registration. It sounds like the worst job the army has to offer. It isn’t. You just stand there all day long and open body bags, figure out which parts maybe belong to which dog tag—not that it’s usually that important—sew them up more or less with a big needle, account for all the wallets and jewelry, steal the dope out of their pockets, box them up, seal the casket, do the paperwork. When you have enough boxes, you truck them out to the airfield. The first week maybe is pretty bad. But after a hundred or so, after you get used to the smell and godawful feel of them, you get to thinking that opening a body bag is a lot better than ending up inside one. “Graves” is a horror story; sure, there’s a vampire in it, but the horror has as much to do with the reality of war as with the supernatural. It’s an outwardly simple story with a strong emotional core, and economical and evocative writing, and a chilling ending. “They find the first dead body that afternoon. Nice shot, says the gun. The girl looks down at the dead man. In contrast, Yoon Ha Lee’s story “Warhosts” has wonderfully lyrical prose and ornate imagery, exemplified in this sentence: “Once upon a time, there was a fortress made of polished hegemonies and hierarchical crenellations. In the fortress lived a girl who dreamt bullet dreams.” “Warhosts” took me a long time to read, both because I was lingering over its lovely prose, and also because of the numerous levels of storytelling happening. There are multiple stories within stories, a Penrose staircase of images. There’s a labyrinthine quality to this story, and I was forced to slow my steps down to the pace of the prose, in order to understand it on its own terms. Other stories suffer from tired plots, whose interesting twists still fail to make their stories memorable. Carlos Orsi’s take on the Heart of Darkness trope in “In Loco” is to set the story in the future feudal barbarian lands of Scandinavia, with a narrator that is explicitly “dark-skinned.” Rather than deconstructing the trope, however, he merely follows it. “Suits” by James L. Sutter suffers from its narrator’s naivete: “Halfie” is a child-sized clone created to perform maintenance on military exo-suits, who idolizes his superiors until he sees them in action. It’s also afflicted with a blank and generic setting, as are a couple other stories, such as “Mission. Suit. Self.” by Jake Kerr. 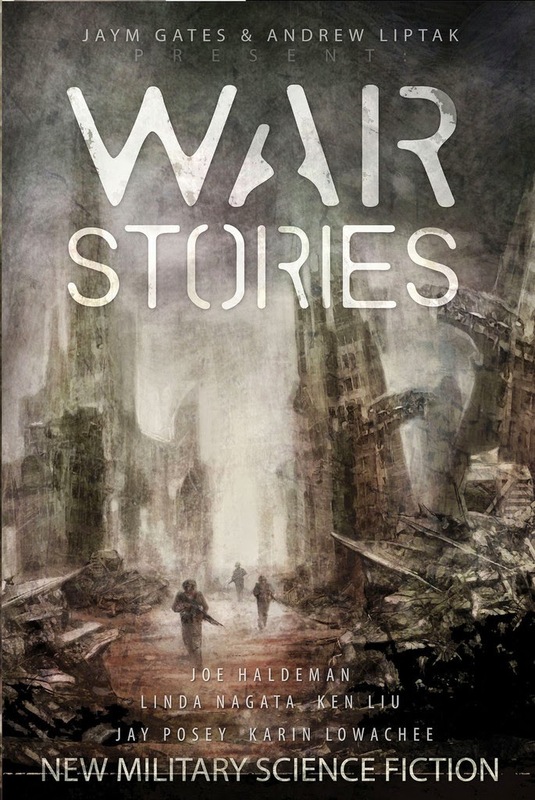 On the whole, however, the only place where War Stories really faltered for me was in its last story, “War 3.0” by Keith Brooke. On its own, “War 3.0” is a fine story, examining that ways that technology could effect conflict; not the soldiers, but the citizens. Can a war be started, and possibly ended, by some well-placed marketing? It’s a fascinating question. However, placement matters in an anthology, and choosing this story to close out War Stories is hard to understand. I’m not even sure why it was included in the last section of “Aftermath”, since it seems to be showing an incipient conflict rather than a concluded one. Given my choice, I would have rather the book ended with the penultimate story, Karin Lowachee’s “Enemy State.” This story moves with the same frenetic energy of two people falling in love, and the prose reads like a rhythmic lament. They say not to expect the same you. I’m not the same, so we’re even. Distance and time flayed us both alive. Military fiction is not meant to prepare us for the reality of war. For some authors and readers, it’s a fertile ground to explore the human condition, and for others, it’s a place to exorcise their past. I’m not the pacifist I was at fourteen (thankfully!) but I was happy to see that as many of these stories deconstructed the received narratives of wars as repeated or supported it. Between September 11, 2001, and my graduation from high school two years and a half years later, nearly every book I read was about war. In school, we read Vonnegut’s Slaughterhouse-Five and Heller’s Catch-22, studied John Hersey’s Hiroshima, Nien Chang’s Life and Death in Shanghai, Stephen Crane’s Red Badge of Courage. I watched Doctor Zhivago, Reds, Bridge on the River Kwai, Barefoot Gen, M*A*S*H*. I read and reread the Tomorrow Series by John Marsden, a YA series about teenage guerilla fighters in rural Australia. But the distance never shrank like it had. Like many millennial Americans, war has happened at a controlled remove from my life, through the distance of a television, a movie screen, a book, a Youtube video, a news article, a hashtag. War is all around us, though, and it takes a willful blindness not to acknowledge it. The world is steeped in conflicts of varying scales. The best stories in this anthology remind its readers of two inviolable facts: at the heart of human condition, there is conflict. And at the heart of every conflict, there is a human story. This sounds amazing. I am definitely adding it to me to read list.